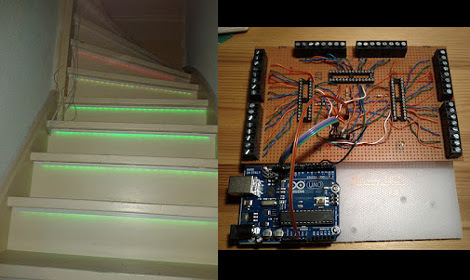 We really like [Geert’s] take on accent lighting for his stairs. He built his own LED channels which mount under the bullnose of each step. 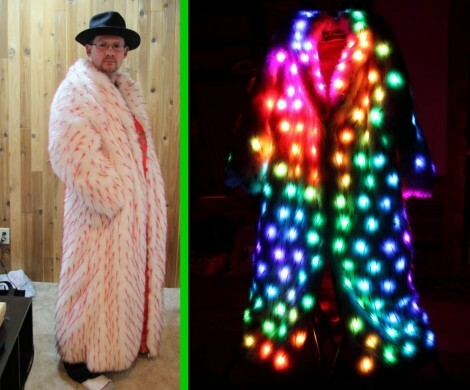 The LED strips that he used are actually quite inexpensive. They are RGB versions, but the pixels are not individually addressable. This means that instead of having drivers integrated into the strip (usually those use SPI for color data) this strip just has a power rail and three ground rails for the colors. Ten meters of the strip cost him under forty dollars. 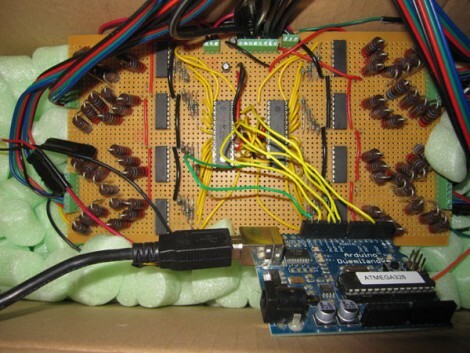 He did want to be able to address each step separately, as well as mix and match colors, so he designed the driver board seen above to use a set of TLC5940 LED drivers. These are controlled by the Arduino which handles color changing and animations. It will eventually include sensors to affect the LEDs as you walk up the stairs. Each strip is mounted in a piece of angle bracket, and they’re connected back to the driver board using telephone extension wire. Nothing says Cold War like a map of the work with LEDs embedded in it. Throw in some analog dials for good measure and you’ve got a piece that would be comfortable mounted next the WOPR in everyone’s favorite ’80s-computers-run-amok movie. 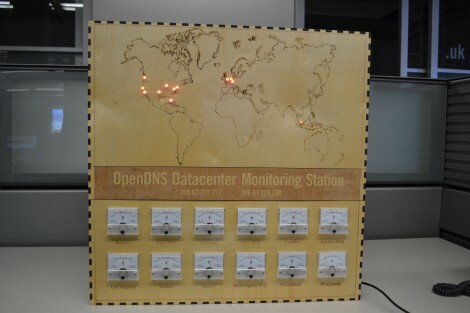 We think [Dima] really hit the mark when building this status panel for OpenDNS datacenter monitoring. [Dima] works for OpenDNS and wanted to make something special for its upcoming 5 year anniversary. He’d already been toying with making boxes from laser-cut wooden pieces. This was just a matter of choosing a size that would fit the dials and leave a suitable area for a laser-etched map. Each of the twelve panel meters gets a PWM signal from the Arduino Mega that he used to bring the device to life. It shows a comparative server load for each data center based on the previous day’s numbers. There is an LED in the map for each of these centers. Right now they’re all red, but he used RGB LEDs and plans to upgrade the capability soon. He should have no problem doing this as he sourced some TLC5940 drivers to extend his I/O capabilities. The Equinox clock is made up of simple parts but a combination of fine design and precision make it a gem of a timepiece. The guts are made up of an Arduino, a DS1307 real time clock, twelve LED drivers, and sixty RGB LEDs. 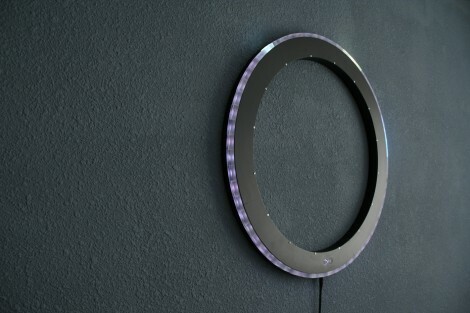 These combine with a capacitive touch interface to tell the time using three lit blocks for the hours, one for the minutes, and a fading block for the seconds. See for yourself after the break. To our delight, [Bram Knaapen] shared the specifics of the case. The black ring that makes up the body was laser cut and spray painted. 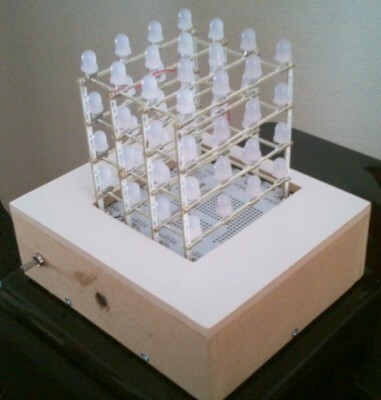 He uses small blocks of acrylic that have been sandblasted to diffuse the light. This is also a great example of clean circuitry using interconnects between the different circuit boards. We always enjoy seeing clocks no matter what level of finish is involved, but great design is something that makes us want to hang a project on the wall rather than stow it in a parts bin.